some of these symptoms, then you might be dealing with a cold case of plantar fasciitis. other words, it is a type of repetitive strain injury causing foot arch and heel pain. Common causes of this chronic inflammation can be due to excessive jumping, standing for long periods of time, wearing high heels, high impact activities or sports. It can be found mostly in middle-aged people, runners, overweight people, or individuals who have flat feet or spend large amounts of time standing on their feet. Foot stretches. A very popular exercise that is often recommended for people suffering from plantar fasciitis is foot rolls. Foot rolls are an excellent and practical way to stretch the arches of your foot. Most people tend to use anything from a frozen water bottle and a tennis ball to a foot/hand massage roller. Rolling your foot over a frozen water bottle can give you both the benefits of icing and stretching in a single exercise. Here is an excellent guide to foot rolls and other easy exercises to alleviate foot pain. Orthotic Insoles. Using orthotic insoles or inserts in your shoes can help greatly in removing stress from your plantar fascia while adding comfort to your feet. There are a wide variety of brand insoles that might help, click here for a helpful list. Also, when you are experiencing pain from plantar fasciitis, you want to have shoes that provide the most cushion and comfort to your feet. Unless you are spending the day at the beach, it is very important to avoid using flip flops. Many doctors highly discourage the use of flip flops, even amongst people that don’t have plantar fasciitis. The reason for this being that their super thin and flat structure can cause your feet to overgrip, putting a large amount of stress on your foot arch and plantar fascia. Medical Splints. A lot of doctors highly recommend medical splints to be used in the evenings. 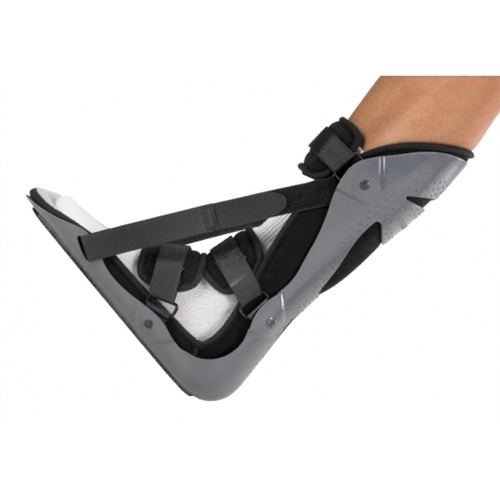 Medical splints can stretch the arch and calf, managing to lighten pain and loosen the muscles of the foot. Here is a great list of medical splints and braces that are specifically designed to deal with plantar fasciitis pain. Ice Packs. Ice, which is known to reduce inflammation and provide relief, is a very inexpensive way to treat plantar fasciitis pain. According to professionals , ice can cause blood vessels to temporarily constrict and slow down the flow of blood, reducing nerve sensations of pain. Using ice cubes wrapped in a cloth or engaging in frozen water bottle exercises, such as the one mentioned above, are good ways to use icing for plantar fasciitis pain. Here are more examples of how you can use icing. Acupuncture. A very well known type of alternative medicine, acupuncture, has been a popular approach to alleviate pain associated with plantar fasciitis. Acupuncture, the insertion of needles into specific nerve points of the skin, can help reduce inflammation, relax tissues and improve blood flow. Here is more detailed information pertaining acupuncture treatment for plantar fasciitis pain. While there are many different at-home ways to treat pain associated with plantar fasciitis, it is highly recommended to first speak with your doctor about your particular medical case and treatments. We hope this guide was helpful, please list your questions or comments in the section below!